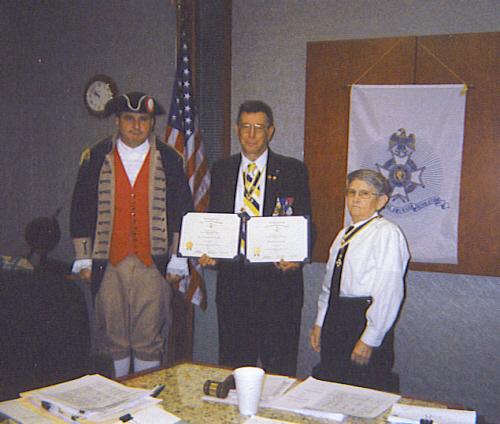 President William Hartman and the Harry S. Truman Chapter Color Guard is shown here presenting two Certificates to the MOSSAR Color Guard Commander Robert L. Grover of Independence, MO. On behalf of the MOSSAR Color Guard and Harry S. Truman Color Guard, Compatriot Grover accepted the C. Lloyd Yohe Yearbook Award of Excellence for year 2007. Compatriot Grover accepted these certificates at the 280th Harry S. Truman meeting on September 13, 2008. First Award: "MOSSAR Color Guard" met the requirements for a C. Lloyd Yohe Yearbook Award of Excellence for year 2007. Signed by Bob Comer, MOSSAR President, on 26 April 2008. Second Award: The Missouri Society of The Sons of the American Revolution Certifies the "Harry S. Truman Color Guard" met the requirements for a C. Lloyd Yohe Yearbook Award of Excellence for the year 2007. Signed by Bob Comer, MOSSAR President, on 26 April 2008. (L-R): Dirk A. Stapleton, Vice-President; Major General Robert L. Grover, MOSSAR Color Guard Commander, and William W. Hartman, President.